One of my favourite outfits to wear bar none is my tattoo shirt and leggings from Wild Rose Tattoo Shirts. I have always had a bit of the wild child about me and love to startle, but as you get older many of the options to do this just aren't a good choice. When I was in my 20's everything was backless, slit down to the waist in front, slit high up the legs or super short with a great pair of heels. That look had to be left behind, so the options to make a statement needed to come from another direction. 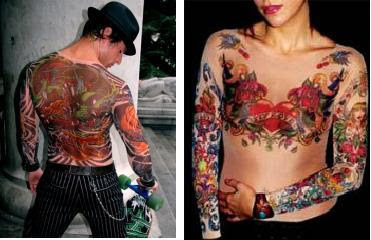 Enter tattoo wear - painless, easy to put together and your look can change on a moments notice. Best of all, I feel amazing when I wear it. I first met the talented artist behind this line, Susan Setz, when my daughter started modelling at age 16. Danielle began doing leg modelling for the company's website and over the years expanded that to have several opportunities. I actually styled a shoot (one of my very few) using these garments that was published in Raine Magazine. Then I spent a year working part-time in the office. Setz is a very gifted artist, one of the hardest working business people I know and a truly nice person to boot. Everyone time I show up at a fashion event in my tattoo outfit it's a hit (I actually have had a few versions over the years but the current is definitely my favourite). So today I decided to give some background on this hidden Vancouver treasure. Born and raised in Alberta, Setz honed her business and design skills by running both printing and tailoring businesses. On moving to Vancouver she spent time in the movie industry doing garment breakdown. While between jobs she happened to notice the tattoos sported by girls in some music videos. The tattoos were appealing, the pain and the permanence was not. 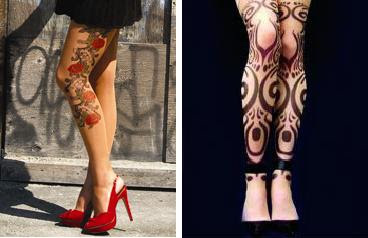 An idea blossumed to try and print original tattoo art onto sheer stretch mesh and Wild Rose was born. Setz remembers, "It was a huge learning curve for me, plus the whole computer aspect of it - photoshop - back then I could only send email...I have learned how to be a dye subber and work with knits. Every knit is different, the warp and the weft, and what you want to do is fit that around the body with no wrinkles. Where the bends are the shape of your pattern is differnt. It's a really challenging and wonderful experience." It took a lot of experimenting to come up with just the right fabric - strong, sheer and non-run so that edges could be left raw to blend in with the skin - as well as finding the perfect dye. Patterns were drafted and adjusted until the garments laid perfectly flat on the body. Connections also had to be made to artists who could produce original tattoo work, but eventually it all came together. Copycats have come along, but none have been able to match the quality and originality of the Wild Rose Tattoo Shirts line. If you hand wash and take care of these garments, they LAST! Customers are still wearing them ten years after purchase. Working for Setz for a year let me get up close and personal with the process. Original art comes in and the designer has to carefully decide which will both appeal to her customer as well as adapt to the shape of the garments. Any not chosen are returned to the artists and those slated to go into the line are purchased, even if only a small portion can be used. The artwork is then scanned into the computer and adapted to fit the pattern pieces: mesh shirts, leggings, single sleeves and jacettes (like a tight bolero). Artwork is printed onto a special paper using fabric dyes, sheer mesh is cut and then the design is heat set onto the fabric. Even the sewing of the final garments is accomplished in the Vancouver studio. Both men's and women's styles are available. Since its inception, the line has expanded first to cotton t-shirts with tattoo sleeves inset and then to stunning burn-out t-shirts with the tattoo art printed on the shirt itself (front only, back only or both front and back - with or without tattoo sleeves sewn in). Always pushing for new areas of design to explore, Setz designed a clothing line, created a t-shirt with the artwork bleached out of the fabric and an amazing tattoo dress. Not all ideas end up being a part of the permanent line, but it keeps a visit to this business always interesting because you never know what new ideas you will find there. This blog is particularly timely for those readers in Vancouver as Wild Rose Tattoo Shirts will be a part of the upcoming East Side Culture Crawl on November 26, 27 and 28th. So if you're intrigued by the ideas here, or you are one of those who have seen me out in my tattoo wear and asked me where it came from, here is your chance. You can meet the designer, see what's new and get a great deal on a piece (or several) for your own wardrobe. I will be there on Saturday and Sunday helping as well, so be sure and come by (1000 Parker St., 2nd Floor) and say hi. 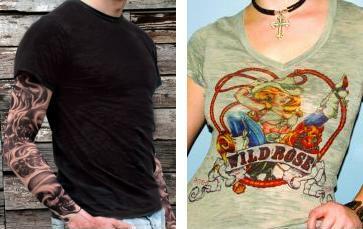 In the meantime you can check out the new website at www.wildrosetattooshirts.com.